Aperol is Campari's demure little sister, and features an irresistible combination of sweet and tart. This cocktail will be enhanced if you can pull off a flamed orange peel, a fancy party trick that always gets a gasp–and genuinely imparts a delicious flavor to your drink. 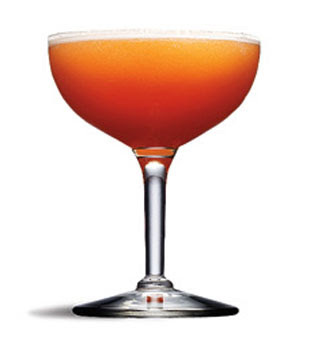 Combine Aperol, gin, lemon juice, syrup and a dash of Angostura bitters in a shaker with ice; shake for 10-15 seconds. Strain into a chilled coupe or cocktail glass and garnish with a flamed orange peel. Conventional oranges, coated with a thick wax to keep them from spoiling, are ideal for flaming; their tough skin helps create an impressive ignition. Cut a silver dollar-sized round of orange peel, avoiding fruit which will extinguish your flame. As you cut, try not to bend the peel; you'll release the oils before you've had a chance to light them up. Hold a match about an inch from the peel, with the pith facing you and the peel towards the drink. Editor's note: John warms the peel for a moment or two out of habit, although I'm not sure there's any real need. Squeeze the peel in half towards you, neither too fast nor too slow–this part might take some practice. The only way to burn your fingers is holding the match too long; once you've lit it, commit! The match will likely stay lit after you've flamed your peel, so be sure to extinguish it. If you're feeling shaky, this video is clear and helpful, but you can always skip lighting stuff on fire in your kitchen, too. Image by Levi Brown for Bon Appétit, Recipe by John Britton. Not sure if I could pull off the party trick but I would definitely give it a go for a taste of this lovely!! Well, that's just darn pretty. I'd love to see John do it! 1. This looks delicious. But 2. OMG I want to flame an orange peel now I've never even seen that done! I love it! The first time i saw an orange peel!!! Nice!!! Mmmmm, that looks so yummy. Hope you have a good weekend!